Airmail letters to and from the Philippines cost fifty cents from April 21, 1937 until November 1, 1946, although service was suspended on December 8, 1941 and not resumed until August 14, 1945. 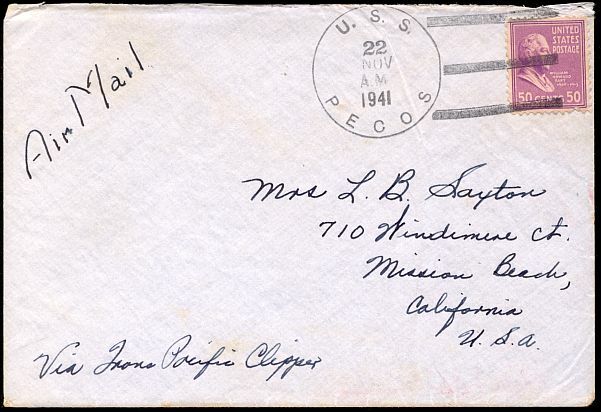 This cover was mailed from the Philippines on November 22, 1941. The U.S.S. Pecos was a fuel carrier operating in the area at that time. It was sent to work in Australia and Java at the outbreak of World War II, and was sunk by the Japanese on March 1, 1942.